I don't know if anybody's keeping tabs on the Now Reading section of the sidebar. If you do, you will have noticed that it seems to have frozen. Could it really be? Has Ms Bookish given up on reading? Of course not. I'm just reading books that don't really fit into my usual categories. Yes, I'm reading knitting books. Gasp! Shock! Horror! And when I'm not reading about knitting, I am knitting. Or listening to knitting podcasts. I'm even contemplating setting up a knitting blog because otherwise Fourth Edition might just crumble under the weight of my ruminations on yarn I want, patterns I adore and angsty reflections upon my knitting abilities. You know, same type stuff that I used to blog about at my former blog .. but substitute "first edition books" with "limited edition handdyed yarn". 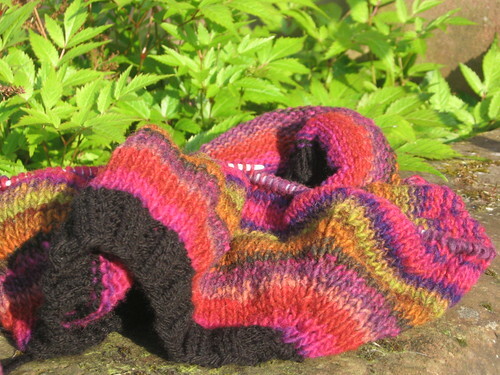 I'll be mulling over the knitting blog idea for a few more weeks. Days. Hours. Oh sod it, here's a picture of my first sweater. It's colourful. Expect slightly more refined stuff from my hand, though. PS. Happy and constructive vibes please as I'm seeing a neurologist tomorrow.